I offer something really special called the Miracle Membership, and in this post I want to give you a taste of the magic. I’m sharing some of the exact content my Miracle Members get each month — including a full meditation. This Miracle Membership meditation is from December 2018. It’s dedicated to holding a vision of a new way of living. Sit in a quiet space, press play and follow my lead. I believe meditation is one of the most important elements of a spiritual practice. I also know that it can be tough to meditate on your own. We have enough obligations in our lives — meditation shouldn’t be another task that requires a lot of time and effort. Instead, meditation should be a reprieve from the outside world. A time to still your mind, let go of stress and allow intuitive guidance come through. That’s why I make it really easy for Miracle Members to meditate. Every month I share a new guided meditation, and they’re all under 15 minutes so you can easily fit them into your day. My monthly podcasts typically run about 40 minutes to an hour, but I thought I’d share a powerful moment that really resonated with the Membership. This clip comes from the October 2018 podcast episode, which is all about how to receive miracles. You can start putting these steps to use today, so press play and listen now. Every month as a Miracle Member you’ll get a brand-new podcast episode from me. Recording the podcast episodes for the Miracle Membership is something I always look forward to. I love sitting in the studio and riffing on a spiritual topic with you. It reminds me of the early days of my career, when I coached small groups in my studio apartment. There’s something so special and personal about it. In these audio lessons I share personal stories and teach on that month’s topic. You’ll come away from each one with simple and powerful spiritual tools and techniques you can apply in your everyday life. This clip is from a talk I gave called Manifest Miracles. I get real about manic manifesting and how to truly attract what you want! When I’m onstage I really come alive. It’s one of my favorite places to be! So I’m psyched to give you a video each month recorded at one of my live events. Sometimes the Gabby’s Greatest Hits video is of a talk I gave very recently, and sometimes I dig deep into the archives to bust out a classic. I also love to share some great audience Q&A’s, because chances are you’ll be able to relate to the questions being asked! Each month in the Miracle Membership has its own mantra to ground and guide your practice. For example, this month’s mantra is “I step into my confidence,” so all the content (the podcast episode, guided meditation and lecture video) supports that mantra. While there’s new content every month, you can experience the Miracle Membership however you want. You don’t have to “finish” everything each month — remember, it’s always there for you. Plus, from the moment you join you get access to the entire archives. That’s 4+ years of content! If there’s a certain topic that’s really resonating with you, then explore the archives and dive into past content. Trust that you’ll be guided to exactly what you need when you need it. You might decide to practice one of the Kundalini meditations for 40 days, go deep with manifesting or focus on abundance. You can also search the archives for topics you’re interested in, like work, relationships, self-love and so on. Your spiritual practice shouldn’t be a chore. Enjoy the Miracle Membership in whatever way works for you! 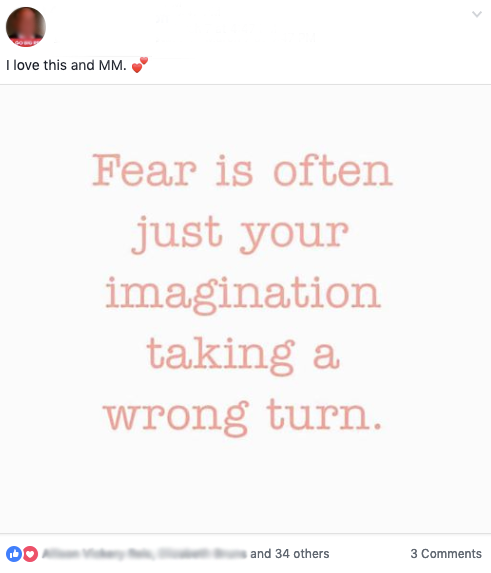 In our private Facebook group (more on that below) I lead a live training every quarter. These trainings are about an hour long. During them, I teach on core spiritual topics and answer your biggest questions. You can join me live for these trainings, and you can always revisit them in the Facebook group and in your Miracle Membership portal. Often when you’re on a spiritual path, you can feel somewhat alone. Maybe your family and friends don’t share your spiritual beliefs or aren’t on personal growth journeys. Maybe you like having a lot of spiritual running buddies for support and motivation. Or maybe you just want an uplifting online community! One really special part of the Miracle Membership is our community. We have a private Facebook group where Miracle Members ask for advice and support, celebrate wins, discuss the monthly content and more. It’s seriously one of the best places on the internet. And I make it easy to introduce yourself to this supportive community, so if you’re more introverted there’s an easy way to get in the mix. One cool thing you get each month is a gorgeous meditation challenge calendar! You can print it out and mark each day that you do any kind of meditation. At the end of the month, share a picture of your calendar in the Facebook group and celebrate your progress. It’s awesome to have the support of spiritual running buddies! Another way we kick off each week right is with Sunday encouragement emails! Every Sunday, check your inbox for a note from me. In each one I share an inspirational lesson, prayer, story, or further guidance on that month’s content. In order to become a Super Attractor, you must allow yourself to feel good. Because when you feel good, you attract more. When you feel good, you serve the world. In order to become a Super Attractor, you must allow yourself to imagine what you want to experience — and not hold yourself back. In order to become a Super Attractor, you must know that you are entitled to miracles. Period. What would it feel like to say “I am entitled to miracles” and believe it without a shadow of a doubt? If you don’t fully believe it yet, that’s okay. But I’m going to ask you to imagine that you do. Imagine what it feels like to know that you are entitled to miracles. Sit quietly for a few minutes and imagine the feeling. You can also open your journal and free-write your response. This weekly email is a really beautiful way to wrap up the weekend and get excited for the week ahead. A few minutes of stillness and positivity help you feel aligned and energized. 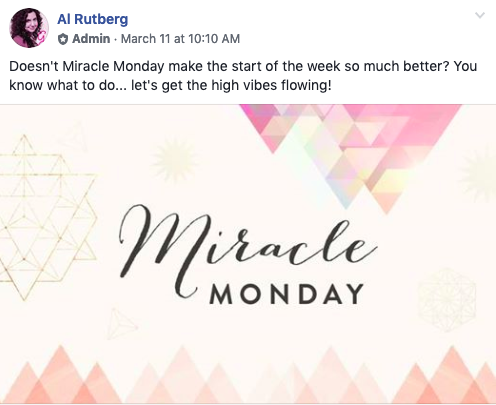 I post the content of each weekly email in the Facebook group, too, so it’s easy to connect and talk about the topic. As a Miracle Member, you get a 50% discount on most of my digital courses! I have courses on everything from Kundalini yoga to my Judgment Detox method to healing your relationship to food. Once you purchase a digital course, you have lifetime access, so you can take them at your own pace and revisit them whenever you want. For many years there was something I really wanted but couldn’t find. I wanted one place I could go to that would have all the spiritual content I loved to soak up. Meditations, inspirational talks, lessons and a community of like-minded people I could connect with. I knew that if I had this, it would be so much easier to feel spiritually connected every day. If I had a tough day, I could watch an awesome talk to raise my vibration and feel great again. If I needed a certain kind of meditation, I’d easily be able to find it and practice it. If I wanted to meet spiritual running buddies, they’d be right there to support me. And if I wanted something fast, it’d be easy… because everything I wanted would be in one place. I wouldn’t have to hunt down video clips on YouTube or skip through my audiobooks looking for the right spot. I looked all over the internet for this, but no one had created it. So I took the Universal cue and created the Miracle Membership! I launched the Miracle Membership in 2015 to be your spiritual home base and give you everything you need to stay consistent on your spiritual path. The Miracle Membership is a subscription platform that helps you stay spiritually connected so you can live with more joy and abundance. So you know that you’re spiritually supported all the time. And so you can co-create the life you want! One member said that the Miracle Membership is “the next best thing to having Gabby as your personal coach.” I love this description, because it’s exactly what I was aiming for. Wondering if the Miracle Membership is right for you? If you want an easy and fun way to stay consistent with your spiritual practice, then the Miracle Membership is for you. 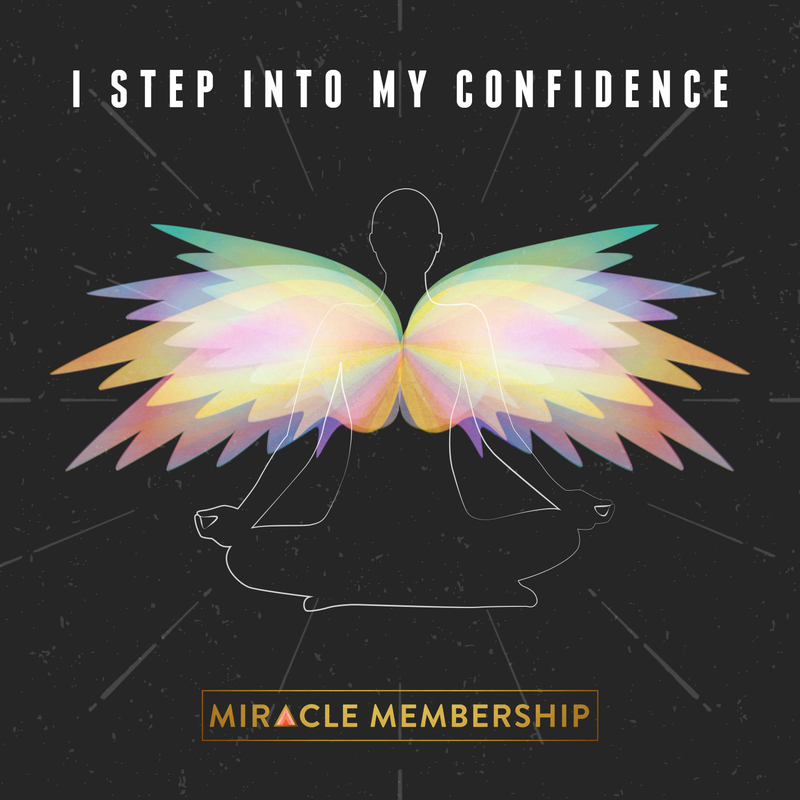 If you want to feel connected, supported and inspired every day, then the Miracle Membership is for you. If you want an awesome crew of spiritual running buddies, the Miracle Membership is for you! Interested in checking it out? Click here to get all the details, read what Members have to say and more. It’s super easy to become a Miracle Member, and we have two subscription options so you can pick what’s best for you. Click here to get all the details! Wooooow! Exactly what I needed today: thank you for all of this. Witnessing my negativity! It’s so perfect and exactly what I teach my students. Thank you for the reminder right when I needed it. Well written…with some great inputs. this is chock full of useful information I read a lot of blog posts but this is very informative. I can’t wait to dig deep and starts utilizing the resources you have given me. your exuberance is refreshing.